Jessica Woods presents a check to Rev. 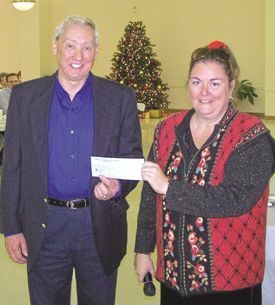 Dr. Phillip Morris for $230 from the Highlands-Lynchburg Chamber of Commerce to the Highlands Ministerial Alliance last Thursday at the Highlands-Lynchburg Chamber of Commerce Luncheon. Crosby ISD to hire new coach in Feb.
CROSBY  According to Superintendent Dr. Keith Moore the local school district intends to hire a new Athletic Director and Head Football Coach (one in the same position) early this coming February. Crosby ISD will be taking applications until Dec. 16 for the position to be vacated by Coach Kevin Flanigan. Thus far, according to Dr. Moore more than 100 applicants have posted for the position. Applications will be reviewed over the holidays and by the first week of January, according to Dr. Moore, the first round of review will begin. 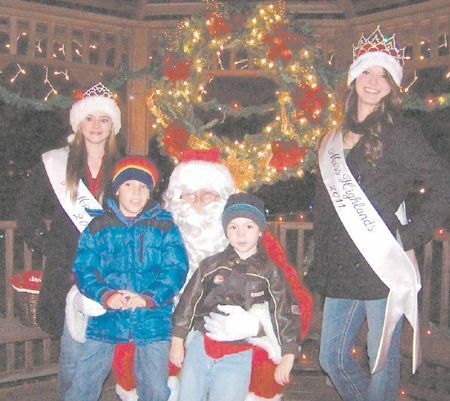 Preliminary interviews will begin and by the second week of January a list of candidates will begin being reviewed. By the January 23 board meeting plans are to have some solid candidates listed to be reviewed by the Board of Trustees. This is an open position we are looking at guys in the district as well as several states away to fill this position with a qualified applicant. said Moore. The plan is to put forth a candidate from the applicants by February 1, he indicated. I feel confident that we will come up with a well qualified applicant and we plan to put him to work on February 1. Moore answered. According to Moore, Crosby is an attractive position, it has a single middle school that the kids come from so a coach can review their progress. There is great athletic and community support for the programs in this community. 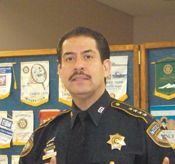 Highlands Rotarians heard Harris County Sheriff Adrian Garcia, as their featured speaker at the luncheon on Nov. 15. Garcia is in his third year as Harris County Sheriff, having won the election in 2008. Prior to that, he spent 23 years with the Houston Police department, and in 1999 was named by Mayor Lanier as director of the citys anti-gang office. He also served on Houston City Council for six years, serving part of that time as Mayor Pro-Tempore. Garcia also has been asked by the U.S. State Department to advise them on law enforcement in Central America, and on port security matters. Sheriff Garcia told the Rotarians about the budget problems that his office and the whole county have had, and how they have had a hiring freeze since 2009. Because of this, he has been unable to staff the jail and some patrol divisions to required levels. He has lost 200 personnel in that time period, and not been able to replace them. Garcia pointed out that the Sheriffs department has over 4000 employees, of which 2900 are Deputies and about 1000 are support persons. Due to the manpower shortage, he has had to find creative new ways to become more efficient. This includes using volunteers, technology, and judicious use of overtime. Citizen involvement can help, he said, from tips that come in, to use of the Citizens Police Academy. In fighting crime, time becomes our enemy, he said. Send in the tip NOW keep information flowing to the Sheriff. If you see something, tell someone. Garcia said that the crime rate for major crimes in Harris County is down or steady over the last year. The Sheriffs office is responsible for running the County Jail, for Bailiffs in the Courts, and for Patrolling the unincorporated areas of the county, where 1,500,000 people live and work. His office works on major crimes, including Identity Theft, Terrorism, Gang Activity, Drugs and Gun smuggling, and maintains a SWAT team for emergencies. One recent initiative he is proud of is an Explorers Program for young boys and girls, introducing them to police work and encouraging them to later become law enforcement officers. This is a new program, started at the Wallisville substation, and now has 200 youth involved, with more to open. Technology is an especially important tool to increase the efficiency of his department. Using cameras and radars, he is in charge of security for the Port of Houston and the Ship Channel.. He encourages citizens to go to the departments website, www.hcso.hctx.net for more information, to call the department with tips at 713-221-6000, and to report information to iwatchharriscounty.com. Any of these tip lines can be used anonymously, he said, and will help his department reduce crime in our areas. There is also an App for your phone.